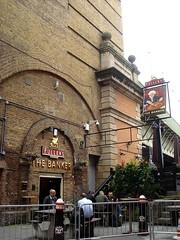 A Fuller's pub behind Cannon Street Station, under the rail bridge. This pub primarily caters to an after-work crowd of businessmen and (unsurprisingly) bankers, hence you will see a lot of suits in here. Having said that, it's also got plenty of space, great river views and good food. There's a terrace alongside the river, some of it under the rail bridge photo. One end of it is outside, by the river banks, and gets particularly crowded when the weather is good. Inside are multiple levels, including a bookable space up above the bar area. On the bar is a good winelist, decent lagers, nitro-kegged Honey Dew and the Fuller's range of handpulled ales; on Kake's June 2011 visit the ales were London Pride, ESB, Discovery (£1.78/half), and Gale's Seafarers. Food is served noon-9pm Monday, and noon-10pm Tuesday to Friday. The highlight of the menu is a series of rather expensive platters, such as the 'pies and pasties platter' (£18) photo, not all of which is meat-based. They have a separate platter for vegetarians, as well as some other regular pub mains. Accessibility: Step-free at the entrance, which gives access to the bar, toilets, and some seating; however, all the seating on this level is at high tables. The only normal-height interior seating is up several steps. Last visited by Kake, June 2011. Opening hours and food times taken from Fuller's website, July 2011. Last edited 2013-05-10 06:43:25 (version 8; diff). List all versions. Page last edited 2013-05-10 06:43:25 (version 8).